A mom-designed solution that makes it easy—and less messy—for little hands to grab munchies. If snacking was an Olympic sport, kids would crush it—just like the cheesy poofs you'll find later in the stroller. 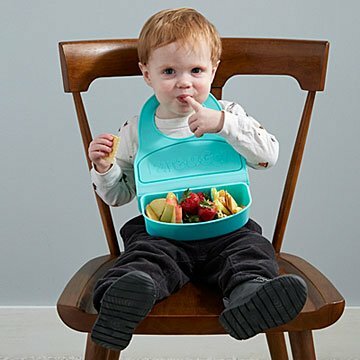 Designed by a mom who's always on the go, and never excited about laundry, this combination airtight bib and food container makes it easy for little hands to grab munchies. Parents can properly proportion a few options using the dividers, and it's made from food-grade, dishwasher-safe silicone for quick and easy cleaning. An adjustable neck opening means kids of all ages can wear it. Sorry adults, you'll still have to use a plate. Made in China. Do not use abrasive cleaning agents. Top rack dishwasher safe. Microwave safe. Be sure to remove the top and utensils before microwave use. Use this product with adult supervision. I bought this for my friend's grandson, she loved it, so did her daughter. I got it for his 2nd Birthday. His mother and grandmother are really busy women. Bought as a gift for first time parents who are on the go a lot. It is fun and inovative. Perfect for the toddler on the go! Perfect for the 2 year old who is having too much fun playing but still needs to eat. I use the product everyday! It is so amazing. The kids keep clean, they feel independent feeding themselves and it makes meal time fun. I am always in a crunch for time and Dare-U-Go! is a life saver!!! !